Elegy. Electronic. Elephant. Ele is back with its 5th serving and it is a big one! A young label known for its dusty jazz samples and superb deep house releases is coming strong this September, with the ELE 005 EP, courtesy of house music legend: Cottam. 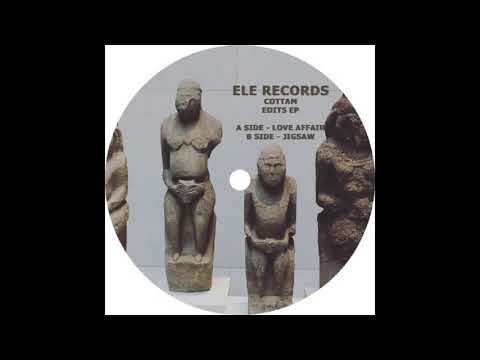 Following the triumph of their last collaboration ELE 001 – Cottam Edits it only seems right! Get ready for some more beautifully enchanting music. The first track ‘Love Affair’ is a floor-filler and ready-made disco classic. The second ‘Jigsaw” is an alluring deep dark bassy one. The tracks on the record are signature Cottam brilliance with pristine touches, sample-heavy cuts and David Mancuso-esque editing. Each track is made with love, passion and true feeling. First track, ‘Love Affair’ will have you spinning around in a disco fueled haze with its uplifting groovy sounds. Using the same techniques of editing and mixing as the great Larry Levan, Cottam has crafted another floor-filler for dancers everywhere. As a craftsman who never does anything by half-measures, Cottam digs deep to find 70s disco jams from Constellation Orchestra and moulds the track into his own new funky vibe that is a true hit! Balancing his own hectic life as a father, this track touches the hearts of listeners fighting their own struggles and was made for anybody in need of momentary bliss. Whether the Preston producer is building a happy-go-lucky feel-good track or a dark alluring afro beat spectacle, his music is filled with spirit and vitality and to celebrate the release of ELE 005: Cottam Edits 2 we interviewed the enigmatic sampling guru! Thank you so much for taking the time out to do this. We loved your last collaboration with Ele, it was everything we could’ve hoped for and more. How do you keep the creative rivers flowing yet hold on to your signature sound? I don’t, consciously anyway. I just have a fiddle until my head starts nodding furiously. The “signature sound” is probably because I haven’t got a scoobies what I’m doing…. Something that I love about your music is the rusty, granular vocals that you sample. In your classic, EDITS B SIDE – I believe in every word he belts out… but I don’t understand Nigerian. That’s a powerful gift you have, an ability to convey emotion and have the listener transcend. Where do you find your samples and what is it about the African rhythmic vibes that resonates with you? I’m not really sure, but wow do they ever. The rhythms/drums and the frenetic energy first attracted me to them, back when I was a straight up techno head. As I listened to more and more the whole musical vibe had me hooked. I get them from my modest collection of afro type music or films. Ele is a sample-based, fairly young and dynamic label, with former releases from Byron the Aquarius, Werkha, Contours and other talented artists. What attracted you to working with Ele? It was Sameed really. We have chatted over social media etc etc for quite a while. He’s just a top bloke, in it for the right reasons. I could see he had a vision so to speak. Art work/music/etc etc. He was, kinda, local at the time we first discussed it as well. Was a no brainer, top bloke, semi local, into same stuff (ish)… bingo…. Autumn is here and what a beautiful summer of music! I hope you enjoyed spending some downtime with your loved ones. As a husband and father, how do you balance music production and family life? I don’t really. Well, I have time when my young lads at school and my older girls and Sian are at work. When they gat back it all gets turned off. It has kinda taken a back seat since I gave up regular gigging. Have had a hard time coming to terms with not gigging regularly etc etc so the music has really been lacking. I’ve realised now, after a long break, that I need to carry on, make time, get sucked in again. It’s good for my health and wellbeing and that in turn will be good for family life. Your music is raw, uncut and emotive. ‘Jigsaw’, is a favourite of mine, the elements mesmerizing, entrancing you into a thumping tribal session. We’d like to know how you perfect your tracks in the studio. What is in the secret sauce? What’s the methodology behind a Cottam track? I have no secret or secret sauce (unless you count umpteen cups of coffee and croissants). I’m a novice who just fiddles and fiddles until I think, that sounds alright. Usually when I start nodding my head uncontrollably. 99% of my fiddling just sits a rots on my computer as they’re a wee bit, well, they’re bobbin’s. Since putting Preston on the house music map, have you noticed any changes in the music scene in your hometown? Let’s imagine we are making a Cottam movie. It’s a biography with a few events added for entertainment purposes, but for the most part it’s a true story. Could you list some tunes that we would hear in the soundtrack to this hypothetical movie? Would you say that you use music production as a crutch, a hobby, a sport or all three? It’s a hobby, always has been always will be. I don’t know what I’m doing so its hours and hours of fun just fiddling. The djing/mixing side of things is more me though, playing for hours and hours with no one but myself as an audience is bliss. It’s always more fun when people are actually there but either way I’m like a pig in sh*t when I’m on’t spinners. It probably has become a wee bit of a crutch since my health started to deteriorate. Maybe I’ve only noticed this recently after a period of no music. It’s part of me, I NEED it!!! You’ve been doing this for years and have put so much energy and time into your craft. Do you have any wise words or tips for emerging artists? I have about as much wisdom on the subject as, well, something not very wise. I just try and enjoy it and try my best. Don’t be afraid to just plough your own path. If you love what you do, hopefully, it will shine through. Even if other people don’t get it, if your really feeling it, carry on. Thank you so much for your time, all the best in the future and we look forward to hearing the EP! ELE 005: Cottam Edits 2 is out now!